Tesla owners in the Carolinas are getting unlocked range and free Supercharging to leave the area. As Hurricane Florence barrels toward the East Coast, it's already spurred evacuation orders for more than 1.5 million Americans currently in the path of the storm. And Tesla Inc. (TSLA - Get Report) is helping its customers get out of the way. With a good chunk of Tesla's installed base and infrastructure located somewhere along Florence's possible route, Tesla is unlocking free access to the company's Supercharging network and unlocking additional battery capacity on certain vehicle configurations in order to help reduce range issues for Tesla owners in the region. "We are temporarily enabling your car to access additional battery capacity, as well as free Supercharging, in preparation for Hurricane Florence. We hope that this gives you the peace of mind to get to a safe location, and will notify you before returning your car to its original configuration in mid-October... Safe travels!" This isn't the first time Tesla has unlocked these features for free due to weather emergencies: September 2017, the firm did the same in Florida for Hurricane Irma. Previously, Tesla offered base Model S and Model X vehicles with a physical 75 kWh battery that was software-locked to 60 kWh in order to reduce manufacturing costs of having another battery configuration. These are the cars that are getting the capacity boost. But with Model 3s becoming more common now, Tesla's decision to also offer free Supercharging is an interesting gesture. Most Model 3 owners pay for power used at Superchargers (right now, owners pay 22 cents per minute in North Carolina when charging above 60 kWh). Tesla's charging network near Florence's expected path. 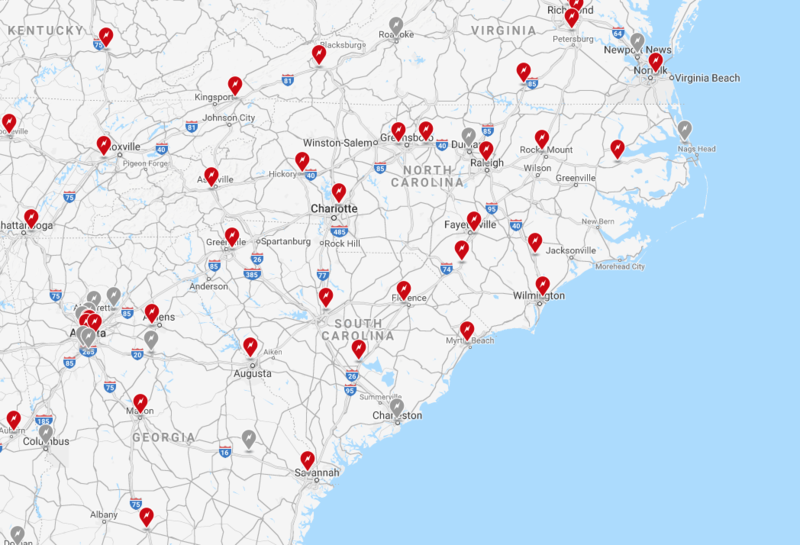 Tesla currently has approximately 39 Supercharger locations either operational or under construction in North Carolina, South Carolina and Georgia. That unpublicized move on Tesla's part has a lot to do with the firm's overall customer satisfaction rate topping other brands in this year's Consumer Reports survey. Despite all the drama surrounding Elon Musk and the continued Model 3 ramp up this fall - drama that's only sure to increase ahead of Q3 earnings later this year - continuing to drive customer loyalty is an approach that should continue to pay off, especially as Tesla buyers in recent years eye another upgrade cycle. On the flip side, the impending storm and resulting power outages are likely to compound frustrations for Tesla Energy customers currently waiting on Powerwall energy storage, which continues to be supply constrained.